It’s that time of year where homeowners are thinking of their gardens and outdoor spaces and it can be daunting to know where to start. Many homeowners have discovered Houzz and are using this platform to source products, research and hire professionals. 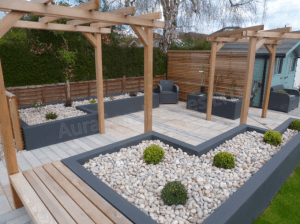 Over 2 million homeowners in the UK are using Houzz to create and share idea books and connect with professionals on the site in order to renovate their gardens and outdoor spaces. When it comes to function most wanted gardens that are easy to maintain (67%). The most popular months to start a project – March and April! 1 in 5 homeowners with an existing lawn are opting to reduce its size, removing it completely for garden beds (54%), hard landscaping (48%) and outdoor structures (43%). Artificial lawns are on the rise and 7% love a living wall. What are the trends for gardens and outdoor spaces? 85% are spending money on outdoor living products with entertainment at the forefront of their mind. Of this 85% garden furniture is the most popular (58%), BBQ’s (4 in 10) and fire pits (3 in 10) are near the top of the list. As its the UK you can expect patio heaters are being snapped up by 13% and a further 8% love a pizza oven. Finally some important considerations for our gardens and outdoor spaces…family friendly space and spaces perfect for our four legged friends! 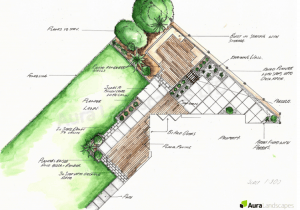 Your gardens and outdoor spaces require a lot of thought before embarking on a design and build project. So, have you considered having a garden design to ensure your garden will meet all your needs i.e family and pets considered? Do you hold lighting as an important aspect of your outdoor space and do you need to include this in your plan? Do you like the idea of a living wall, seating, fire pits? If so do you need to speak to a specialist landscape contractor that can fulfil these requirements? Have you tried Houzz.co.uk to create an idea book or just to get inspiration? 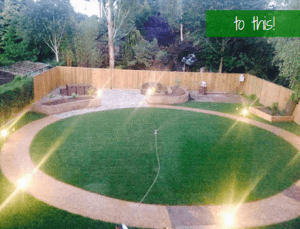 These are just some of the questions you need to think about when planning your gardens and outdoor spaces projects as well as when looking to choose the perfect garden designer and landscaping specialist to complete your project.